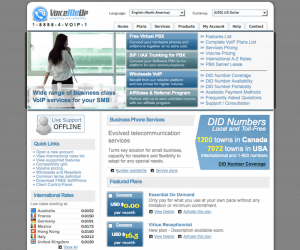 VoiceMeUp is a VoIP provider geared specifically towards businesses. It offers a number of monthly plans with varying features, or an on-demand service that allows you to pay only for the calls that you make. Regardless of the plan chosen, the company offers a number of standard features, including caller ID, VoiceMail, free in-network calling and your standard call forward, call transfer and return-call features. The service is compatible with many popular VoIP platforms and provides a great deal of flexibility regarding capacity and features, allowing scaling according to your requirements. VoiceMeUp supports a wide variety of PBX software options, as well as offering free virtual PBX if you don’t already have a system in place. The service can be operated via a desktop VoIP phone, and the site offers a free download of the X-lite software-based phone as an alternative for travel or for companies without such hardware, with more advanced softphone software available for purchase. There are several optional features such as international DID numbers, per-channel billing and virtual attendant systems. 1-900 numbers are also available for North American or international territories, as are local extensions. Usefully, VoiceMeUp also provides an optional fax-to-email service. VoiceMeUp charges no setup fees for activating an account, but may do for DID setups and other features. Their website provides an animated configuration guide for new users, however the guide is somewhat outdated and may require some interpretation. The site has a reasonably comprehensive FAQ section, including features like a tool for checking whether your local or toll-free number can be ported onto an account, as well as some basic definitions for some of their features. The FAQ page is a little cluttered however, and the basic questions are buried under a number of more advanced entries. No existing infrastructure is required in order to set up an account with VoiceMeUp, however existing phone hardware will need to be checked against their extensive list of 36-odd compatible platforms before switching. VoiceMeUp has a variety of different pay-monthly plans, providing their standard features plus a selection of more advanced options. These vary from the $26.06 per month Essential 3000 service with a single local number, a simultaneous call limit of 2, some storage space for voicemail and around 50 hours of communication per month. This somewhat barebones plan can be expanded upon with more communication time (Essential 5000 at $34.75 per month), bi-directional channels allowing 2 simultaneous calls to be made or received (Elite Duo at $49.95 per month) and other, pricier plans which provide even greater simultaneous call limits, more numbers, virtual fax and virtual attendant services. These plans vary between $49.95 up to $149.95 per month, with the most expensive service (Extreme Hexa +) providing 6 business lines with 2 local DID numbers, 2 toll-free numbers, virtual attendant and fax, 10 simultaneous calls and 100MB of space for storing voicemail. Support from VoiceMeUp is available for a price, and is charged at one of three levels based on the type of support needed. You can buy one or more hours of support in advance, receiving a 6-digit PIN with which you can redeem the time. Basic support for connecting and configuring the system is available at $65/hour, whilst assistance in customization of the system (e.g. programming, queues and custom dial plans) cost $105/hour. Sales support is available via a live support link on the website, or via a messaging system when support is offline. Great service and outstanding quality and reliability. Ive tried many providers and this is the most reliable so far. The staff is very friendly. Cheers.